Tri Counties Bank has started the Carr Fire Fund 2018 account with an initial deposit of $25,000 to benefit victims of the fires ravaging our community in Redding, California and surrounding regions. Those who would like to make monetary donations to the Carr Fire Fund 2018 can at any Tri Counties Bank Branch or they can make a donation online. The funds will be distributed to people in need through the United Way of Northern California, directly serving fire victims with immediate needs. This non-profit organizations has been vetted as a trusted and well managed direct emergency service provider. Funds will be allocated to fire victims based on proportionate need and expected impact. On behalf of Tri Counties Bank, we thank everyone who donated to assist the victims of the Carr Fire in the Redding, California area. 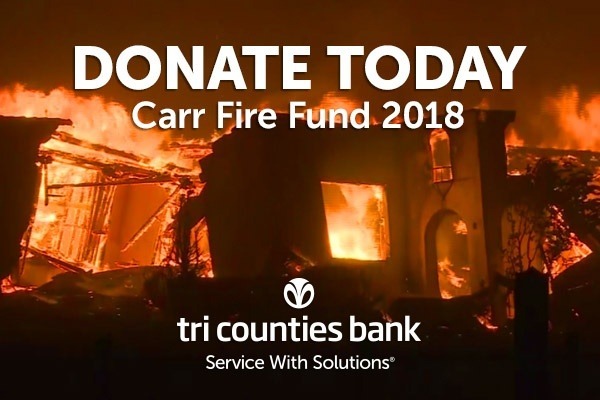 As of October 1st, the Tri Counties Bank Carr Fire Fund has raised almost $500,000 through GoFundMe and in-branch donations. United Way of Northern California has raised an additional $839,255; the combined amount totals $1,339,255. United Way has already provided cash relief to 1,073 individuals and families, totaling $682,277. The organization is now entering relief efforts for longer-term recovery needs, including the provision of intensive financial support to those families hardest hit by the fire who have the most limited resources to cope. To apply for relief for the Carr Fire or Shasta Fire, please go to https://www.norcalunitedway.org/CARRfire. On behalf of Tri Counties Bank, we are truly humbled by the outpouring of generosity from our communities to assist victims of the Carr Fire in the Redding, California area. We thank you and commit to being good stewards of your money with our partner, the United Way of Northern California, to assist victims of the Carr Fire. According to United Way, more than $1.2 million has been raised total for the Carr Fire victims this year. United Way is developing plans for utilizing the remaining funds for longer-term recovery needs, including the provision of intensive financial support to those families hardest hit by the fire who have the most limited resources to cope. On behalf of Tri Counties Bank, we are truly humbled by the outpouring of generosity from our communities to assist victims of the ongoing Carr Fire in the Redding, California area. We thank you and commit to being good stewards of your money with our partner, the United Way of Northern California, to assist victims of this tremendous firestorm which is still an active emergency situation. As of August 1, combined donations to the United Way and Tri Counties Bank Carr Fire Fund stand at over $200,000. The funds will be distributed as cash grants to people in need through the United Way of Northern California, directly serving fire victims with immediate needs. Starting Thursday, August 2, 2018, United Way of Northern California will begin taking applications for Carr Fire victims. Applications can be completed in person at the Local Assistance Center at Shasta High School from August 2nd through August 8th (including the weekend) from 9 a.m. to 7 p.m. or online at https://www.norcalunitedway.org/CARRfire. Those who would like to make monetary donations to the Carr Fire Fund 2018 can continue to do so at any Tri Counties Bank Branch or online at https://www.gofundme.com/tcb-2018-carr-fire-fund.